This is a reminder to those of you who fancy the chance to get involved in a current Goldsmiths Disabled Students Campaign namely the #startingtheconversation campaign. The campaign runs alongside a current project that Thomas Cori, my partner in job share as Disabled Students Officer is running. It is to raise awakeners of Mental Health and to give people the opportunity to express their views on why we should talk about Mental Health conditions. 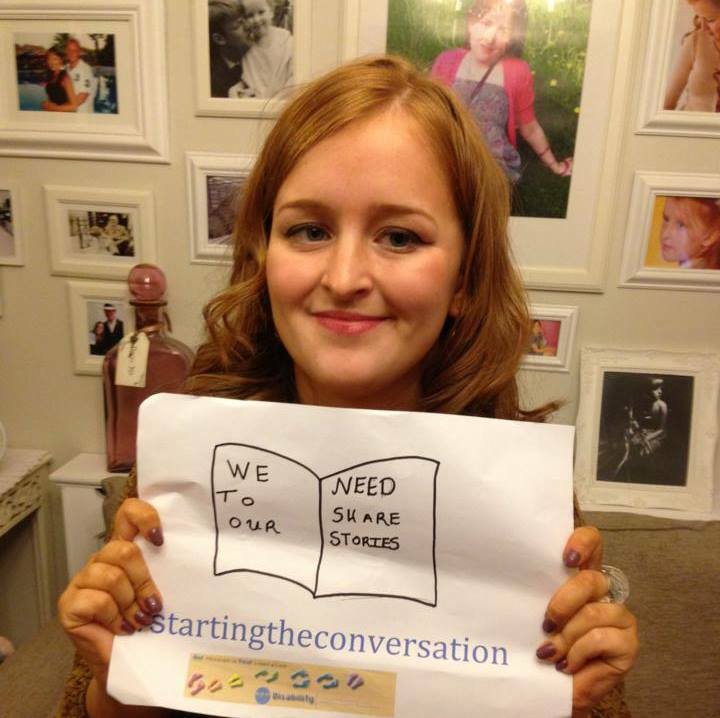 My entry is a headshot of me holding a sheet of paper with an image of an open book, the open book has the words ‘We need to share our stories’ written on it and underneath the book the #startingtheconversation is written. Take a photo or make an image that you think represents your views on Mental Health Awareness and why we should talk about it more. The image should include you and your views expressed in some way, ideally written on a card or sheet of paper in which you are holding. All entries MUST have the #startingtheconversation hashtag written somewhere in the image. You can use the attached file which has the #startingtheconversation and GSU Disability promotional logo already on it. All entries MUST express a reason or reasons why you think we should talk about Mental Health conditions. Spread the word by sharing it on facebook, twitter, your blog or any other way. Email your images to disabled@goldsmithssu.org. Deadline for submissions is 12pm (noon) on Monday 18th November 2013. PLEASE NOTE: You do not have to be a student of Goldsmiths to get involved all are welcome to participate. Don’t forget, spread the word and get creative!